Alternating Current (AC), is a far-from-perfect power source. AC power technology is well over a century old and was never designed to meet the exacting standards of today's high resolution audio-video components. AC noise is present at the utility source, and is then exacerbated by radio frequency noise that is induced (picked up by the AC power cord) and coupled to the component power supplies and to circuit ground. This creates distortion and low-level signal losses via the "masking effect. 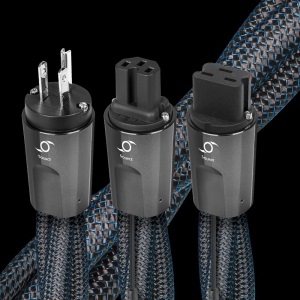 "� Most AC power cords and power conditioner-regenerators, though helpful to a point, are simply not up to the task. Note: AudioQuest Hurricane/Source AC power cable is not appropriate for use with AC power conditioners, power regenerators, AC isolation transformers, AC battery back-up devices, as well as any power amplifier, powered sub-woofer, powered loudspeaker, powered receiver, or integrated amplifier (whether tube, solid state or digital switching). These products will require greater RMS and transient current capacity. In extreme instances, they could suffer diminished performance and/or present an electrical danger by exceeding the AudioQuest Hurricane/Source AC power cable's maximum current capacity. For those applications, we highly recommend selecting the AudioQuest's Hurricane/High-Current AC power cable. Solid Perfect-Surface Copper+ (PSC+) conductors prevent strand interaction, a major source of ear fatiguing transient intermodulation distortion. The astonishingly smooth and pure Perfect-Surface Copper+ eliminates harshness and greatly increases clarity compared to OFHC, OCC, 8N and other premium coppers. The superior purity of PSC+ further minimizes distortion caused by grain boundaries, which exist within any metal conductor. The astonishingly smooth and pure Perfect-Surface Copper further eliminates harshness and greatly increases clarity compared to OFHC, OCC, 8N and other premium coppers. All drawn metal strands or conductors have a non-symmetrical, and therefore directional, grain structure. AudioQuest controls the resulting RF impedance variation so that noise is drained away from where it will cause distortion. The correct direction is determined by listening to every batch of metal conductors used in every AudioQuest audio cable. When applicable, arrows are clearly marked on the connectors to ensure superior sound quality.